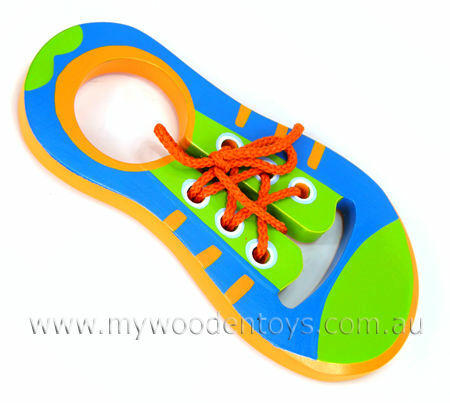 Wooden Toy Lacing Shoe is a solid colourful wooden toy which helps your child learn to lace and tie a bow. This simple little toy is the ideal size for little fingers and comes with the perfect size lace to get down to the tricky business of threading in and out and tying a bow. A great toy to pop in your bag on a trip out. We like this because: "Simple , portable and a great way to learn to tie your shoes "
I had the black wooden doll family delivered with my white one, again within a great time frame and the joint packaging was cost effective. Assistance was offered and updates were regularly sent to me via convenient email to advise me of time-frames, postage tracking & other product offers. The dolls themselves are handsomely crafted & are more beautiful then the picture originally depicted! Great service & excellent products at such a reasonable low price! Will be shopping often through this online shop in the future and highly recommend others choose to do so too!